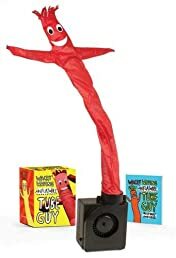 Wacky Waving Inflatable Tube Guy (Miniature Editions) | Your #1 Source for Kindle eBooks from the Amazon Kindle Store! The very first of its kind, this miniature Wacky Waving Inflatable Tube Guy is the perfect desktop companion, tiny marketing tool, or hilarious gift! Finally, the joyous dancing tube man — who's been featured everywhere from Ricky Martin's stage to Broad City — is available in a tiny, desk-friendly size.